If you want to do well with social media, you need a plan. It’s that simple. 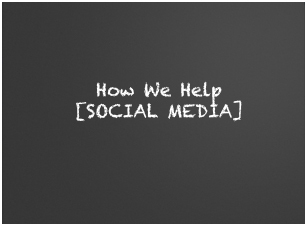 We’re big advocates of establishing at least additional footprints with social media. What does that mean? You should at least have profiles tied to your company name for Facebook, LinkedIn, Twitter and others. Those profiles include company names and brands in the URLs. Why risk having someone else secure a social media URL that would make sense for your business down the road? But that’s easy – encouraging you to get your profiles and secure the names that are suited to your business. Mostly, we craft strategies. We don’t encourage our clients to exceed their budgets by getting overly involved in every social media opportunity that exists. It just isn’t practical. In some cases, we’ll do more with LinkedIn. In other situations, Twitter will make more sense. We don’t just view social media as another way for you to tout your products. Your prospects are looking for direction, answers and solutions to their problems. It’s OK to mention what you sell – occasionally. But you’ll get on the good side of prospects if you’re offering more – tips, insights, guidance, links to other resources, etc. Tie social media to ROI (i.e. branding, web site traffic, forms, special phone numbers, etc.). With social media, creativity is the key. Our job is get you in front of more people that may want what you sell or at least tell others about something you’re offering – whether it’s a service, product or thought leadership report. We also get all the way down to how you’re involved in the community – what you attend, how you serve, etc. Your activities – and the ways your team are involved – can support any number of social media activities.